Wheel spacers - Page 2 - THE PORTAL HUB - Pinzgauers, Haflingers, Volvo 303s and more! IIRC a stock 710M is factory rated at something like 43 degrees (NOT PERCENT grade), and from experience I'd suggest that this number is with a full compliment of passengers. What complicates calculations for a Pinz are the swing axles; at high side grades the low side can go from having all the weight (pushing the wheels UP, increasing stability) to swinging over the half axle (pushing the wheels DOWN and decreasing the stability). The measurements taken from a static, flat surface won't be exactly the same. 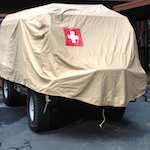 Accessories - winches, hard tops, etc. generally reduce the stability as they are never low enough to improve it. Luckily I only lost a bit of paint on this one. Hopefully will not be adding any pictures to this thread! My Haflinger has the same stability issues in areas of steep slopes and deep holes (wombat holes) and for offroad work I am also considering wheel spacers to assist with stability - yes the pinz and and the haflinger have great ground clearance because of their portals but that comes at the expense of stability in some circumstances - not helped by the swing axle design - so with advantages come disadvantages. I also have a Landrover FC 101 - basic suspension and no portals but I do have diff locks. I have been 4wding in it with a couple of Pinz on a few occasions. The vehicles overall are very similar in offroad capabilities - the Pinz has better clearance under the diffs (though not as bad an issue as you think) but the 101 is far more stable because of its lower centre of gravity and solid axles so sideways it is better than the Pinz. However where there are holes that you can drop a front wheel into - both have the same issues - lifting back wheels high in the air and if going down hill easy to tip - I have nearly gone over a couple of times. So in my mind with all three vehicles the solution is to widen the track as far as you can within reason - load issues may come in. On my 101 I have increased rim width from 6" to 8" an increased the offset of the wheel so that the track has increased by about 1 1/2". With my Haflinger I have 14" rims that are 6" wide so increasing the track but this is offset by the larger diameter tyres so remains unstable offroad. In this pic you could imagine what would happen if my front wheel went into a hole on a slope. For offroad I am also looking at spacers and ATV rims and tyres. So for the Pinz, I think the preferred option would be wider rims with different offset to increase the track but spacers would also work as long as they do not over load the hubs. However driving these cab over designs with this tip tendency in mind goes a long way to reducing the chances. I think the Land Rover FC101 track is about 8 or 9 inches wider than the Pinz also. I wonder how much of the Pinz's instability is due to the swing arm suspension and limited articulation? Unimogs have portals but straight axles and great articulation and seem to have less issues with rollovers - but I think their track is about 15 inches wider than a Pinz. 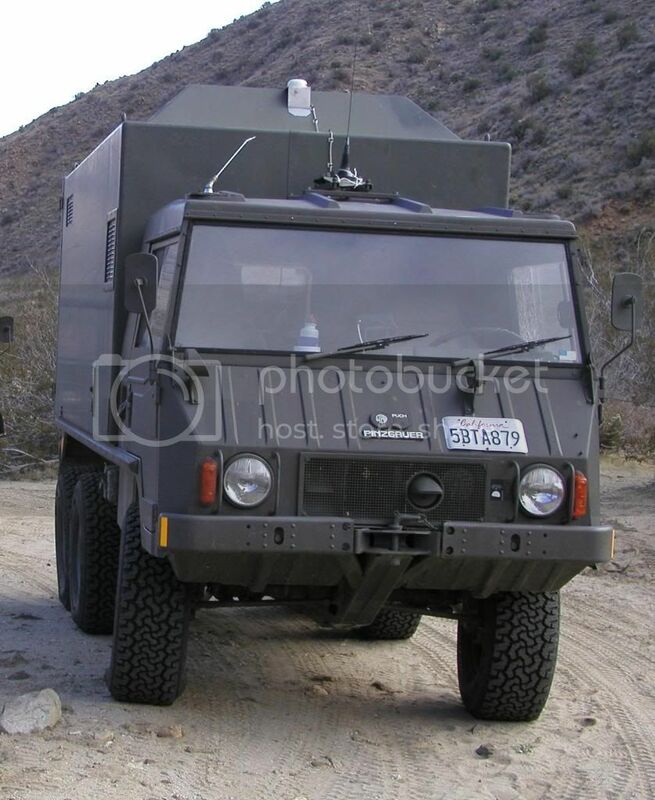 I also think many 4x4 710 Pinzgauers would benefit from trimming the coil spring length on the rear - it reduces the camber when unloaded which is how many pinzgauers typically operate. I did mine many years ago - I think it was just one of the "dead" (non active) coils on one end or perhaps a half coil on each end. Easy to do and worth considering - although if you are going to add spacers it would be better to wait and see what the additional leverage the extended track has on the camber. Volvo C303 -------- 1540 ( 60.6" ) +3.9" ----- 1900 ( 74.8" ) +5.5"
LR FC101 ---------- 1550 ( 61.0" ) +4.3" ----- 1830 ( 72.0" ) +2.7"
Unimog 404 ------- 1630 ( 64.2" ) +7.5" ----- 2140 ( 84.3" ) +15.0"
*Note - Track is to the center of the tire so wider wheels would not influence this value. Haf-e wrote: I wonder how much of the Pinz's instability is due to the swing arm suspension and limited articulation? I think you will find it is a combination of the raised CofG caused by the portals, the swing arm suspension allowing the wheels to curl under a little and the cab over/forward control layout. To a more or less extent these are typical of most 4wd cab overs. In most other scenarios these characteristics are a positive and gives the Pinz its superb offroad ability. 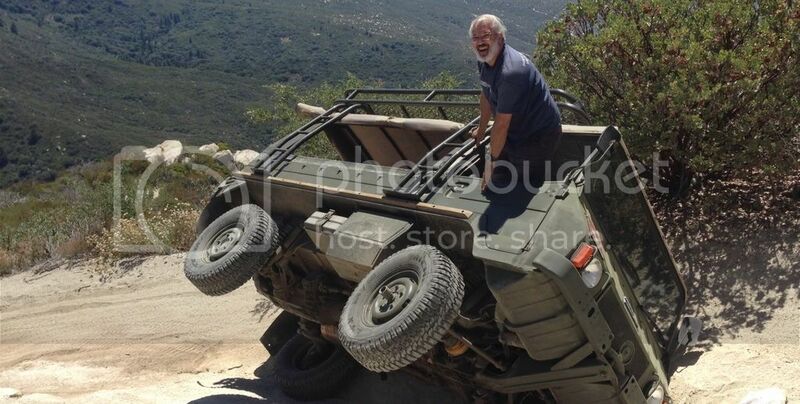 The Australian Military has had some rollovers with the Unimogs and has unfortunately resulted in deaths. The name of the game is to know the strengths and weaknesses of our vehicles and drive accordingly - easier and said than done. (formula SSF = T/(2*H) = Tan(roll-over angle) ). Just got some spacers fabricated by HEM Industries in Dewey Oklahoma for the Hutchinson wheels. Fit great and gave me 2 inch wider print. Pics coming soon.